Pictured at the recent Colgate Caring Dentist of the Year 2018 Awards are Dr Susan Crean, Dr Marcas Mac Domhnaill and Caroline O Halloran (Dental Nurse). They were delighted to represent the Mac Domhnaill Dental team which were nominated for Colgate Caring Dental Practice 2018. Dr Susan Crean and Dr Marcas Mac Domhnaill were both nominated for the Colgate Caring Dentist of the Year 2018. Tá an-áthas orainn ag Mac Domhnaill Dental toisc ainmniúcháin a bheith fachta againn mar fhiaclóirí comhbhách Colgate na bliana 2018. Ó Chlé : An Dr Susan Ní Chroidheain, An Dr Marcas Mac Domhnaill agus Caroline Uí hAllmhuráin (Altra Déidliachta). Tá an-áthas orainn ag Mac Domhnaill Dental toisc gur bronnadh “Gradam Gnó Chiarraí 2018” orainn ag Oireachtas na Gaeilge i gCill Áirne ar an 1 Samhain. 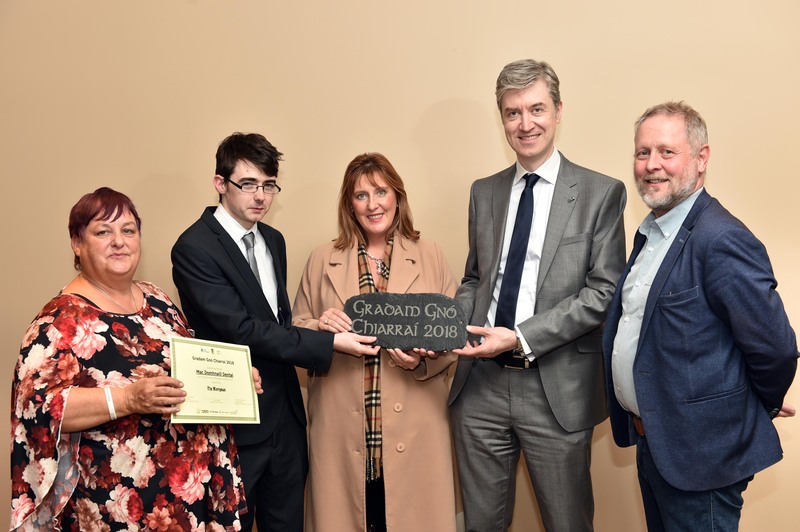 We are delighted at Mac Domhnaill Dental with our “Gradam Gnó Chiarraí 2018” award which was presented to us in Killarney at the Oireachtas na Gaeilge festival on 1st November. This award is for the use and promotion of the Irish language in business in Kerry. 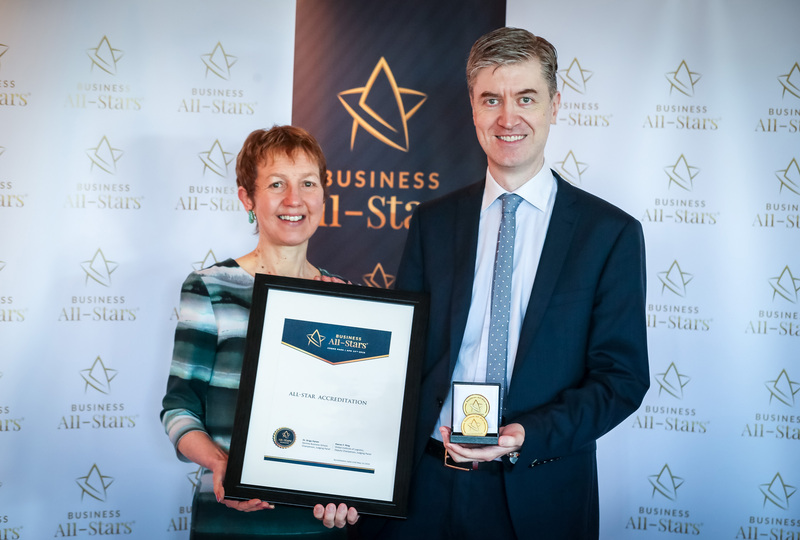 We are thrilled to announce that An Dr Marcas Mac Domhnaill was awarded an All – Star Accreditation in April 2018 for Health Care Professional – Dentistry. The Business All-Star program is an annual competition designed to identify and recognise Irish companies and individuals that have distinguished themselves in the conduct of their business over the last 12 months.The awards were held in the iconic Croke Park and was attended by numerous businesses/winners on the night. 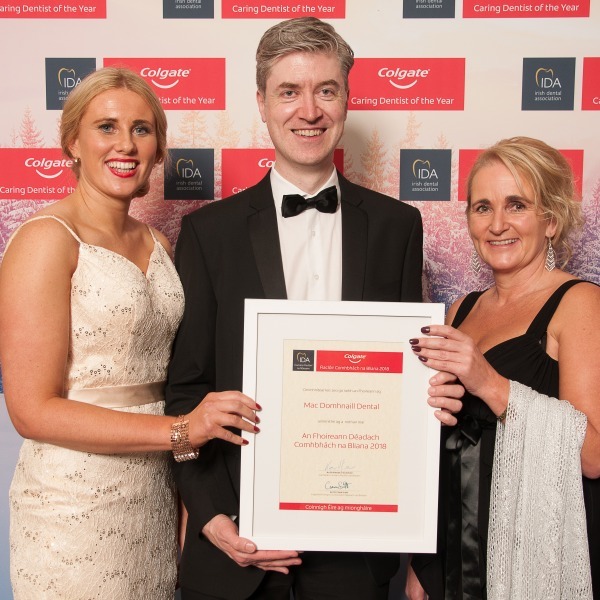 Mac Domhnaill Dental was awarded the An Fhuinneog is gaelaí 2018 Trá Lí in March 2018. The award was presented for the best Irish lanugage window display in Trá Lí for St Patricks Day 2018 and was organised by Kerry County Council. The All-island Q-Mharc Gnó le Gaeilge award system gives recognition to business organisations who evaluate, develop and capitalise on the use of Irish as an additional business and marketing tool throughout the island of Ireland. 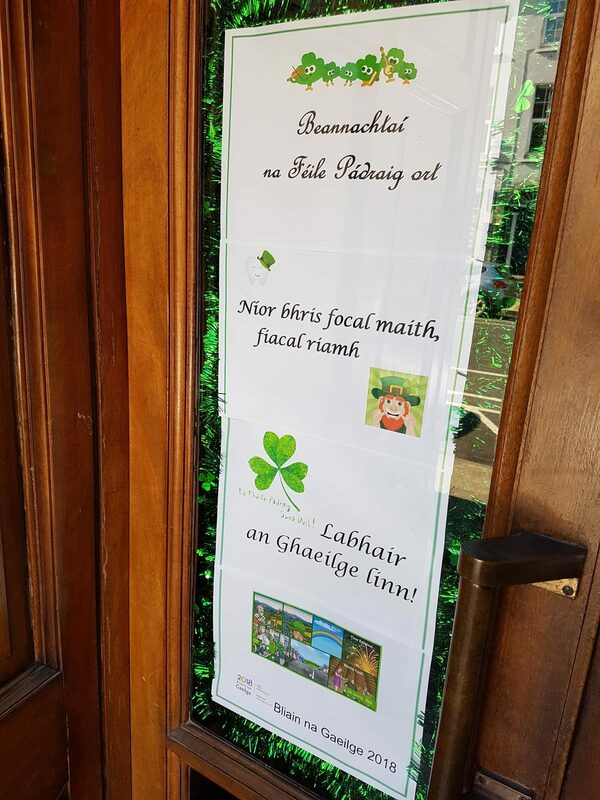 Q-Mharc Gnó le Gaeilge demonstrates awareness and a commitment to bilingualism in business and culture through language, enhancing indigenous characteristics or ‘Irishness’. As well as that, it shows marketing leadership in the provision of innovative customer service. 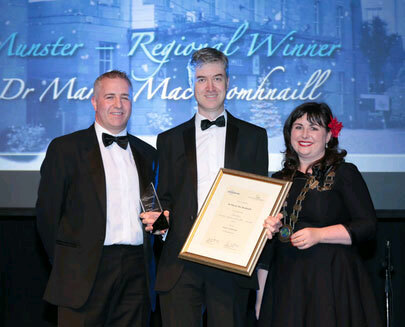 Mac Domhnaill Dental is delighted to have been awarded the Q Mharc award for Excellence in Bilingualism in Business. We are honoured to be one of only seven Irish businesses to have received the award from Foras na Gaeilge in Croke Park on Thursday March 8th. We look forward to offering all our services as Gaeilge and in English to all our patients. We are delighted to announce that An Dr Marcas Mac Domhnaill and An Dr Aoife Ní Chonchubhair were both presented with Sensodyne Sensitive Dentist of the Year Awards. Marcas, Aoife and Dental Nurse Mary Sugrue also accepted an award for Sensodyne Sensitive Dental Team of the Year 2017 on behalf of Mac Domhnaill Dental. These prestigious awards are organised by the professional journal for dentists in Ireland – the Journal of the Irish Dental Association, and are only presented on the basis of nominations by patients. In the stunning venue of the Round Room, Mansion House in Dublin, the Irish Dentistry Awards played host to one of the biggest celebrations in Irish dentistry on Friday 29th January. Over 200 guests arrived to commemorate the very best. 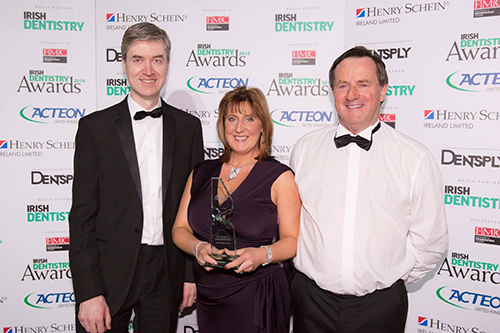 Now in its 5th year the Irish Dentistry Awards has become a must-attend date in the diary. Behind the scenes, the esteemed panel of judges, chaired by the renowned and respected Tony Aherne, had the challenging task of selecting the winning practices and individuals. This was no easy mission as the calibre of entries reached new heights, and the number of entries surpassed all previous years. Well deserved winners on the evening included MacDomhnaill Dental who were awarded Best Charity. Dr Marcas MacDomhnaill was recently the winner of the Munster Sensitive Dentist of the Year at the Sensodyne Sensitive Dentist Awards 2015. Marcas was nominated by his patient, Bernadette Kennedy, for his kindness and attentiveness in treating her after two separate diagnoses of cancer resulted in her losing most of her teeth, and for his tireless charity work in Chernobyl. The Awards, sponsored by Oral Care GlaxoSmithKline, the makers of Sensodyne toothpaste, invite patients to nominate their dentist if they believe that they have gone above and beyond normal patient care. Ms Kennedy said: “Dr MacDomhnaill was always there for me and was always ready to help even when he was not on duty. His kindness goes beyond my story, as he tirelessly fundraises and spends time every year working in Chernobyl, providing treatment to those in need. His kindness has touched my life and made me a much more confident person”. 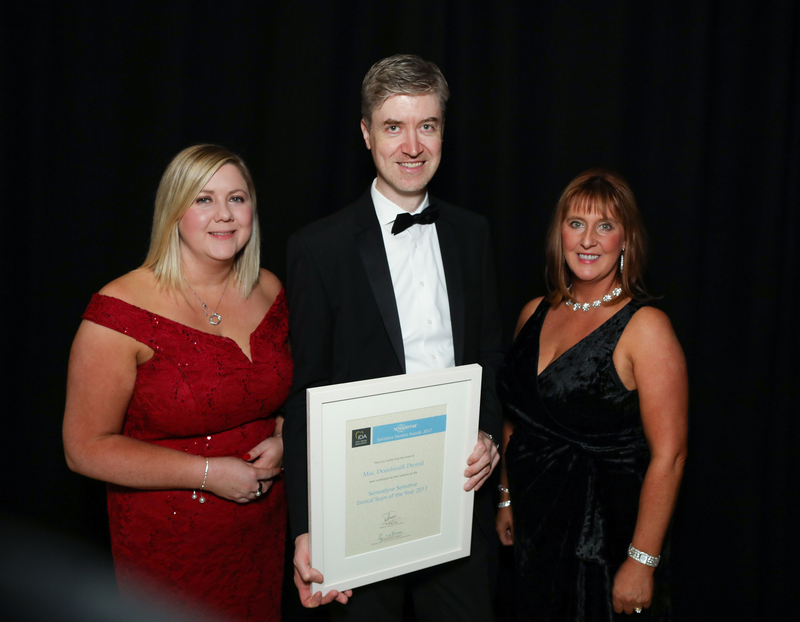 Dr MacDomhnaill said he was “honoured and delighted to receive the award, which highlights the importance of the dentist–patient relationship built on respect for each individual patient and puts the patient first”. 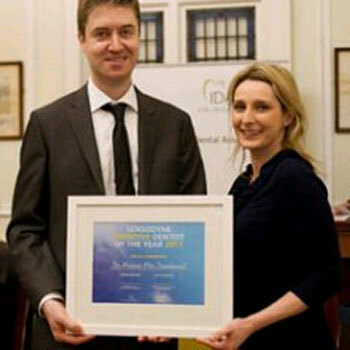 Dr Marcas Mac Domhnaill received a Sensodyne Sensitive Dentist of the Year Highly Commended Award recently. Marcas was one of only five dentists (out of more than 300 entries) nationwide that were recognised by a panel of respected dentists for their work. The judges assessed nominations of dentists that were made by patients. Marcas is pictured receiving his award from Claudia Long of Sensodyne at the ceremony in Dublin, January 2012.